Fans will be able to watch around the world as former football manager Brian Clough is given the freedom of the city of Derby. 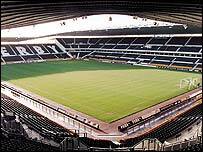 A live webcast will show Clough receiving the honour at a suite at Derby County Football Club's Pride Park. The 68-year-old will then go onto the pitch to greet fans before Derby's game against Ipswich on Sunday. The ceremony is being held at the ground so as many people as possible can pay tribute to Clough. More than 27,000 tickets have already been sold for the game. Clough said in an interview to be broadcast by VisionRams on Sunday: "I've received the freedom of the city of Nottingham and an OBE but this is the icing on the cake. "I'm really thrilled about the whole event - I may be a Yorkshireman but I'm Derby through and through... and you're not getting rid of me." He will arrive at the ground following a tour of the city in a vintage Rolls-Royce which will take in many sites important to the famous manager. They include Derby County's former Baseball Ground and Darley Park where he took his sons to play football. 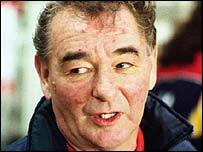 Clough will also plant a commemorative tree by the River Derwent. The manager is well-loved in the East Midlands for leading both Derby County and Nottingham Forest to league championships. He also won two European Cups with the Nottingham club. As a player, Clough won two England caps and scored 251 goals in 274 games as a striker for Middlesbrough and Sunderland. He is the only living freeman of the city and the first individual to receive the award since 1968. The webcast will be available through a link on the Derby County website between 1215 BST and 1330 BST on Sunday.